We know how important is to have a trusted locksmith in any situation, we also know the importance of having someone to advise us properly. In Barcelona Locksmiths La Clau Màgica we know that all this is very important, as we know, prices have to be economic, so that an oversight does not become a nightmare. Besides this, in 24 hours La Clau Màgica Locksmiths work with all brands of locks on the market. Have you left the keys in the house? Do you have stolen the keys? In 24 hours Locksmiths La Clau Màgica took more than 15 years giving locksmith service across the province of Barcelona . We have the best professionals and get excellent results with absolute guarantee. 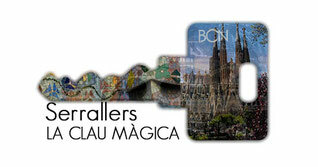 In La Clau Màgica Locksmiths we offer the best quality and prices cheap . We have specialists for all types of locksmith services, such as opening doors, changing locks, opening and installing safes, master key systems, shutters, automation, security doors, security windows, locksmiths to communities, etc. Our main references we can find in: Barcelona ( L'Hospitalet de Llobregat , Badalona , Santa Coloma de Gramenet , Sant Adria del Besos ) Maresme ( Alella , Arenys De Mar ), Vallès Occidental ( Badia Del Valles, Sant Cugat Del Valles , Terrassa ), Baix Llobregat ( Castelldefels , El Prat De Llobregat , Esplugues de Llobregat ), Garraf , Vallès Oriental , etc. Locksmith services: Our team of professionals will take care of everything for any locksmith service in Barcelona. Sevices emergency 24 hours a day. Doors open: C errajeros confidence for opening your door in Barcelona. Fast, economical and effective service. Changes locks: The best professionals throughout the province of Barcelona for replacing or installing their locks , light bulbs , safety devices , padlocks , combination of gorjas , etc. Opening and installation of safes: If you have problems with your safe and wants to open quickly and professionally, we know well how to do it !. We can open any safe in Barcelona or province. Amaestramientos: Masterkeying traditional locks or modernized systems with electronic access controls, as they can be: numerical, fingerprints, facial keypads, cards, etc. Shades: In La Clau Màgica locksmiths perform installation, repair and motorization of all types of shutters. Automation and disabled access: Install, replace and fix the pedestrian access in your community or business. Security doors: We offer the best security in armored doors. We drove to her home free. Safety glasses: Protect your glass against scratches or against vandalism. Locksmiths to communities: Professional and financial managers for communities across the province of Barcelona Locksmiths.